The Pawns are said to be the "soul of chess" since their position on the board often determines the character of the game… whether slow and methodical, or fast and violent. Many chess openings have names associated with them and the pawn structure is often an easy way to tell what course the game will take. The Pawns are the first soldiers into battle and the first to see hand-to-hand combat. They thrust themselves forward and never move backward. It reminds me of the story of Hannibal of Carthage, the legendary Moorish general who led his army against Italy in the famous Punic wars. After having arrived on the shore with his men, he instructed them to burn the boats behind them. He stated, "It's either victory or the martyr's crown." In other words, no turning back. So from it's original position on the second rank, the Pawn can move either one square forward to the 3rd rank or two squares forward to the 4th rank. 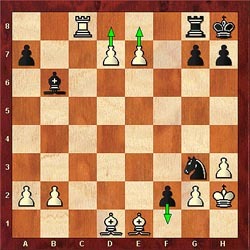 Only from the 2nd rank can a Pawn advance two squares. In Diagram #2, the white Pawn on e4 cannot advance forward because it's path is blocked. 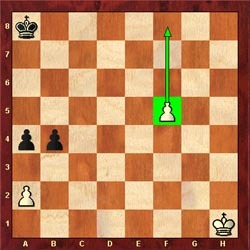 Despite the pawn being worth one point, as it moves further and further up the board, it becomes more and more valuable. 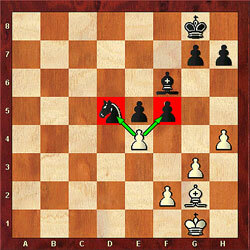 A Pawn moves forward and captures diagonally (one square at a time) as in Diagram #2. 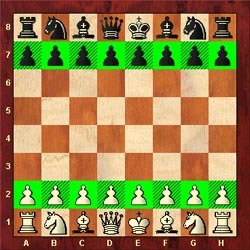 A capture is commonly noted by an "x" in chess notation. There is no forward capturing or jumping over enemy Pawns. Remember, "Pawns march forward, but capture diagonally." If a Pawn survives the fierce conflict and avoids capture he is becomes the most valued piece on the board (besides the King). As seen in Diagram #3, "passed pawn" is one of the most important concepts in chess. It's like a running back headed for a touchdown with no opposing player to stop him from the end zone. Why does this lowly Pawn get so much attention? Here's why. If a Pawn marches all the way up the board and reaches the enemy's 1st rank, then it is rewarded with the option to become either a Rook, Knight, Bishop, and yes… even a new Queen! In fact, it is even possible (but not probable) for one player to have up to nine Queens on the board at the same time! Almost always, the best choice for promotion is a Queen, but there are rare exceptions. 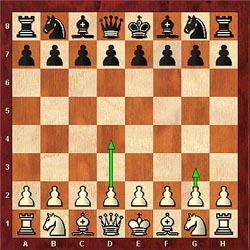 In Diagram #4, if it were black to move, he/she could promote the pawn at f2 to only a Knight and deliver "checkmate!" Ironically, promoting a Pawn to a piece other than a Queen is called "underpromotion." In my high school days it was common to see a player advance his pawns for several Queens because the opponent would not resign. If your opponent has a lone King, one Queen is sufficient to finish the game quickly.